The orientation program of IIM Raipur’s PGP (Post Graduate Programme in Management) and FPM (Fellow Programme in Management) ended innervating the students on a new journey filled with new hopes and determinations. The students got an opportunity to interact with the experts from academia & industry and the learning from them would definitely help the students in the course of their journey. During the 4 days of the orientation program, the students met “Who’s Who” from various industries. Mr. Nikhil Sahni, Senior President & Country Head- Government Relationship Management & Strategic Government Advisory, YES Bank; Mr. Suresh Kumar, Senior Vice President-Human Resources, Mafatlal India Ltd ; Mr. Avinash Parhi, Director (Category Marketing), Shopclues; Mr. Anurag Batra, Chairman, Business World; Mr. Sripad Panyam, Vice President (Products), UrbanClap ; Mr. Raj Raghavn, Director, Country HR Leader–India, Amazon; Mr. N RamaMoorthy, Managing Partner, Ogilvy & Mather, and Mr. Rajesh Gopal, Chief Analytics Office, Vertebrand Management Consulting, shared wisdom on management and entrepreneurship during the various panel discussions. On the last day of the orientation program, the students were informed by Prof. Vinita Sahay, Chairman, International Relations about the different foreign institutes with which IIM Raipur has collaborated in order to provide an opportunity to the students for the Students or Faculty Exchange Program. 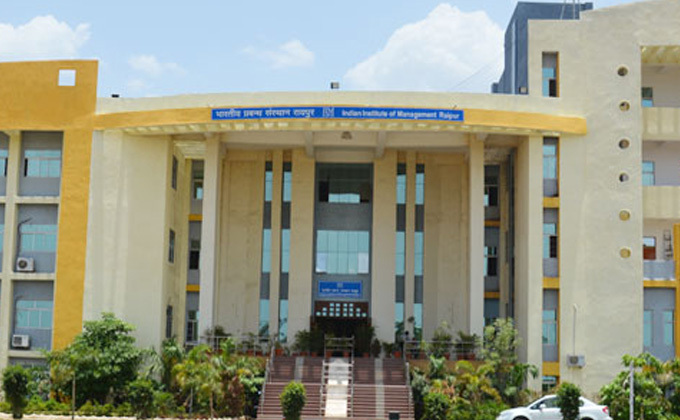 “The foreign institutes that IIM Raipur is currently partnered with are - Asian Institute of Technology, Thailand; Grenoble Business School, France; IESEG School of Management, France; HHL Leipzig Graduate School of Management, Germany; ALBA Graduate Business School, Greece; IPADE Business School, Mexico; Yonsei University, South Korea; University of New Castle, Australia; Victoria University of Wellington, New Zealand & ESC Troyes, France”, shared Prof. Vinita Sahay. Dr. PRS Sarma, Chairman (PGP), interacted with the students and motivated them to give their best in academics and to take part in different B-School competitions as well. He stressed on the importance of discipline and told the students that self-discipline facilitates goals and keeps our attitude elevated. He encouraged the students to work hard and reminded them that there is no substitute to hard work. Following the interaction with Dr. PRS Sarma, Dr. Chandrakanta Swain, Librarian, IIM Raipur, shared about the richness of IIM Raipur library and encouraged the students to make the maximum use of the resources available in the library. An interaction with Dr. Umesh Bamel and Dr. Archana Prashar (Wardens) also took place where the students learnt about the different student activities taking place on campus. The Wardens emphasised that the students were the main drivers for success of any institute and encouraged the students to start considering IIM Raipur as their own and strive hard to bring name and laurels for themselves and their institute. Dr. Satyasiba Das, Chairman Placement, IIM Raipur, interacted with the students and gave them a glimpse of what is expected from them in order to be successful in both their academics and placements. He also encouraged the students to not only focus on the placements, but to also inculcate the spirit of entrepreneurship, to be job creators rather than job seekers. He also enlightened the students about the learning through Case Methods, a teaching approach that uses decision-making cases to put students in the role of people who were faced with difficult decisions sometime in the past. The four days of the orientation programme provided valuable insights to the students to prepare them on the onset of a competitive journey in the field of management.